In the 1960's, Peter Saul's paintings are poised between proto-Pop and Abstract Expressionism. Being an iconoclast, he resolutely avoids being part of either movement. But what a precocious lad he is! Somehow, he gets into the Icebox before Warhol, and then scouts for Guston, who would enter cartoon territory in 1967. Were he a stockbroker, Saul's prescience with Pop would have the SEC on his tail, pronto. Featuring works not seen in over 35 years, this exhibition explores the foundations of Saul's fierce and mischievous artworks. He demonstrates an uncanny rapport with American culture, despite the fact that everything was made while living in Europe. 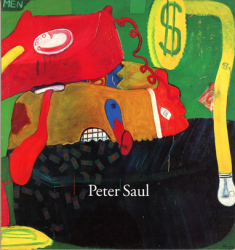 And in many respects, his early work is very much like his current work: Saul continues his ironical investigation of the economic and moral forces that move our society. A 43-page color catalogue will accompany the exhibition, which will be on view from September 20 to October 26, 2002. Peter Saul was born in 1934. This is his third show at Nolan/Eckman Gallery.